Hummer is an off-road racing game from Sega. The game is licensed by General Motors and puts you behind the wheel of a Hummer SUV. Players must navigate a variety of different terrains including snow, mud, and dirt. A single cabinet can operate as a 2-player game using the "Driver Change System". The driver changes according to the timing of checkpoints and contact with other cars. Courses available are Bluster Canyon (beginner), Isolated Jungle (intermediate), Calibou Valley (advanced), and Industrial Hill (pro). There are various obstacles throughout each course which can be destroyed to accumulate boost. Once the gauge reaches maximum, players can use the boost button which makes the player speed up and become indestructible for a short period of time. 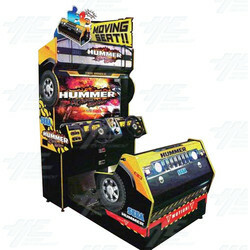 The deluxe cabinet is modeled on the rear end of an actual Hummer, and features a motion base. A single cabinet can operate as a 2-player game using the "Driver Change System". The driver changes according to the timing of checkpoints and contact with other cars.